So, tonight the World Series begins, and the excitement I feel about it reflects my supreme confidence that the Sox will prevail. In my last blog entry, you saw that I used the crystal ball Rem Dawg gave me to predict the exact outcome of the last three games. Well, I’m looking into the crystal ball again and I see the Sox taking the Series in 4 or 5 games. Part of me is a little sad that they’ll be celebrating once again on the opposing team’s home field, but that part of me is quite small, actually….. The real issue in my house isn’t who will win the World Series, it’s who will be able to stay awake to WATCH the World Series, and how do we fit our kids’ school schedule into the World Series schedule? Since becoming Vice President of Red Sox Nation, I have received about 15 emails – some from friends and acquaintances and some from total strangers – asking me to try to do something (in the future) about the late start of these games. These people are not only advocating for their rabid-fan-kids whose experience of the playoffs is the pre-game show and the highlights on TV the next morning, they’re advocating for THEMSELVES. It’s hard for grown-ups to stay up for the end of these games, let alone kids! Rather than complain about the late start of these games, ADAPT to them. 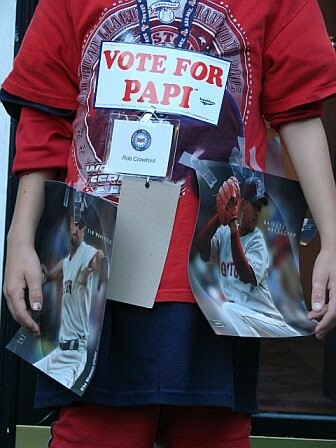 Being a die-hard Red Sox fan, I know you agree that it’s very important for our children to witness these critical moments in Red Sox history that only come once every few years, or decades, or for some people, once in a lifetime. So LET THEM WATCH, and prepare them for extended evenings of TV watching. During the weeks le ading up to the playoffs, start putting your kids to bed later and later so they get acclimated to the brutal baseball schedule they’ll be enduring soon. Once the playoffs start, take your kids out of school after lunch for a two-hour nap, and pump them full of caffeine about an hour before the games start. (Diet Coke and Diet Mountain Dew work well for this purpose.) Around 10:00pm, feed your kids a big bowl of ice cream. The sugar high will keep them going a while longer. What about school the next day? You can try the Diet Coke and Diet Mountain Dew technique again and hope they can survive the day, but since there’s bound to be another game that night, it would be better to let them sleep in and miss the first few hours of school. Hey, you have to make a choice: will it be the three R’s, or the most important R of all? (the Red Sox) The World Series lasts one short week. In Red Sox Nation, it’s the most important week of our entire lives. The choice is obvious. Fox won’t bend, so we have to. Let the kids stay up to watch! Once again Rob, points well made. Indeed, I remember fondly my youth and afternoon, yes I said afternoon, like when the sun is still shinning, World Series games. We would sneak our small transistor radios into school, slip the single ear piece up the shirt sleeve and out the cuff. And then we’d sit in class, palm pressed against the ear, appearing to the teacher that we were paying attention. Ha! We were paying attention to Koufax and Drysdale! But in 1967 my math teacher was enlightened enough to bring a black and white TV into the classroom and let us all watch! Alas today it is all about money for the networks. I guess the Fox executives should be happy it wasn’t a Cleveland-Denver series. They would have been jumping out of their executive suite windows at the thought of those ratings! The only way it will ever change is if MLB and the owners were to value the fans over the dollars. Oh well. At least Dunkin’ Donuts will make out tomorrow morning when everyone needs to order an extra large!